Free Photo Viewer is a pretty basic image viewer which also offers support for many of the most popular brands of mid-to-high-end digital cameras. That means it can read many RAW formats such as those from Sony, Nikon, Canon, Fujifilm and others. The program offers fast processing and was especially designed for people with slower CPUs and has an option in the settings to optimize performance for people with slower PCs. 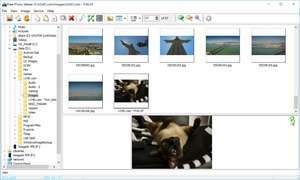 Free Photo Viewer supports EXIF metadata, that is it supports reading of the information stored inside of images written by a digital camera. For security reasons, you should also check out the Free Photo Viewer download at LO4D.com which includes virus and malware tests. Additional screenshots of this application download may be available, too.